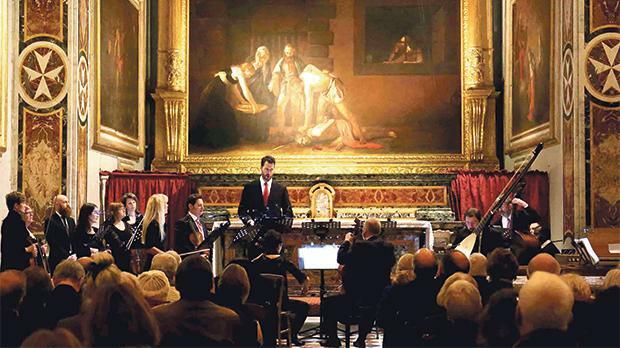 An ode to St John, the harpsichord and more, in this Valletta International Baroque Music Festival review by Albert Storace. It could not be otherwise. 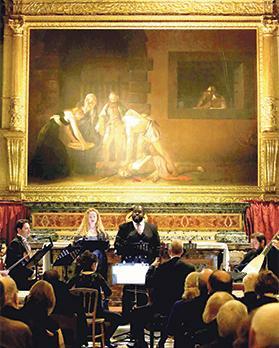 As far as I know, there has never been a performance of an oratorio performed at the Oratory of St John’s Co-Cathedral dealing with the very subject depicted by Caravaggio in his masterpiece at the back of that historic space. Composer Stradella, who was also to come to a sticky end, composed his San Giovanni Battista in 1675. The piece is a setting of the final phase of the saint’s life, climaxing in the latter’s beheading. Just like in any oratorio, the action has to be imagined, hinted at by the music and the text. However, in this case the climactic moment was there before the small audience – perforce small, since the oratory’s dimensions are what they are. Those hints were more than adequately provided by The Haymarket Opera directed by Craig Trompeter, both cellist and conductor. The rendering of the often-dramatic and highly-charged music, with its close intertwining with the text, was excellent. The singing requires all-round excellence too, and counter-tenor Reginald Mobley sang The Saint’s role with conviction, powerful moral authority, pathos and resignation. Bass Benjamin Le Clair was Herod (Antipas), the Tetrarch of Galilee and Peraea. His was a very well-etched interpretation in every way, and his gigantic physique was equalled by the great power of his voice, which he controlled with greatest ease. Lawrence Jones was a reliable Counsellor, and added his own urging to dealing with The Saint. In Ansaldo Ansaldi’s libretto, Herodias is cast as Herodiade la Madre, a less taxing role here, yet still very finely handled by soprano Rosalind Lee. Ansaldi never mentions Salome’s name: she is cast as Herodiade’s La Figlia. This very trying role was unevenly handled by soprano Sarah Gartshore, at least in the first of the two performances under review here. While all the other singers sang with clear diction, hers was not very clear except towards the end of the work. She had a fine middle and lower register, but tended to be screechy and often hovered dangerously between being un­steady in pitch and dragging notes, especially when trying to convey a quasi-plaintive, pleading even frustrated mood when dealing with Herod. The latter’s was the last word, realising in his remorse that he would be forever haunted by his evil deed. The oratorio was preceded by the Prelude and Bergamasca. from Frescobaldi’s Fiori Musicali (1635), performed by organist Jory Vinikour. 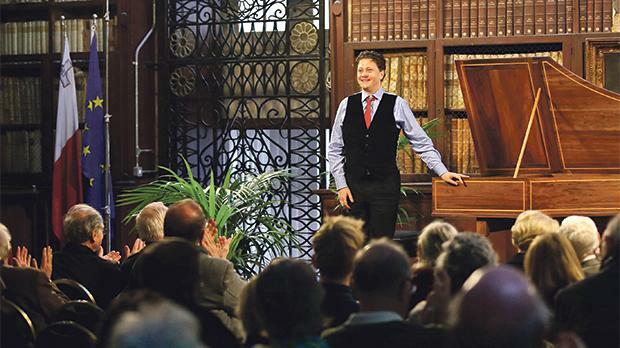 The second harpsichord recital of the festival was dubbed The Harmonious Blacksmith and, like the first, was presented at the National Library in Valletta. This time, it was Jory Vinikour at the keyboard and, if the above dubbing could have suggested an all-Handel recital, Vinikour’s only Handel offering was that famous Suite in E Major, which ends with an Air and Variations on The Harmonious Blacksmith. This was a good start, and was followed by one of J.S. Bach’s very popular Concerto in F Major in Italian style. The sunny nature of the work put one in a relaxed mood, as conveyed by the performer who, in a brief but very communicative manner, said a little something about each piece. The rest of the recital came from the French repertoire, beginning with Rameau’s very evocative Symphonie de Pièces de Clavecin. This famous work comes in nine movements, and it is pretty amazing how very evocative each movement is, not only because of the way the pieces are composed, but also because of certain technical touches that could make them live up to their titles when handled by such a deft master as Vinikour. Le rappel des Oiseaux could easily conjure up images of chattering and twittering birds, or let the imagination stray as to what the chatting was about in the great virtuoso movement L’Entretien des Muses, or hearing the hammering of the one-eyed giants in the concluding Les Cyclopes. Ending the programme were three pieces by Jacques Duphly, last of the great French 18th century harpsichordists. La Forqueray, a tribute to the famous violinist Jean-Baptiste Forqueray, was delicately rendered in a very poetic manner. La Medèe had to perforce be very dramatic, given the subject matter, that of a mother murdering her own children to spite their cheating father. The Chaconne came across as nostalgic and tender, like a last goodbye at an era that was at an end. There was further brilliance in the two encores: Couperin’s La Barricade Mysterieuse and D. Scarlatti’s bright and virtuous Sonata in D.
At the Manoel Theatre, one of Malta’s leading pianists of her young generation, Charlene Farrugia, joined forces with Italian pianist Nazareno Ferruggio. This was a rather successful collaboration, in which both shared the limelight, either performing separately at two pianos or as in one case, performing four-hands at two pianos. Performing chorales in counterpoint was the duo’s mission. When they performed J. S. Bach’s Allein Gott in der Höh’ sei Ehr, the sound was essentially brilliant, almost too bright. Yet nobody would disagree that, had the piano been at that stage of development in Bach’s time, that is what it could have sounded like. The three Chorales by Franck were the only pieces for a four-hand piano set-up. They were beautiful, and the duo brought out the contrasting, yet unifying, differences in these chorales, which are like a hymn of praise and joy. The entire second half of the programme was taken up by Busoni’s truly monumental Fantasia Contrappuntistica. Busoni’s tribute to his idol, Bach, went through many different versions and workings before he left it in its final form. It was a work that required great energy, drive, concentration and interpretative ability not so easy to muster. A combination of youthful energy, determination, insight and stamina produced results that must have made lots of hard work worth the trouble. To my mind, this year’s festival’s only event at the Jesuit church was one of the best, with Alfredo Bernardini at the helm of the European Union Baroque Orchestra. The leader, Finnish violinist Aira Maria Lehtipüh ü Bernardini, is also a virtuoso oboist. This he proved as one of the three oboe obbligato performers (the others were Neven Lesage from France and Spaniard Miriam Jorde Hompanera) in the evening’s first work, the origi­nal version of the Orchestral Suite N. 4, in D. There was also an obbligato part for the bassoon (Claudius Kamp) and, as the work progressed, the sheer fun of ensemble playing and the resulting lively music created an air of rejoicing. The rest of the programme consisted of three of the Bach festival cantatas from the Leipzig days. In Liebster Immanuel, Herzog der Frommen, there is a line in the first recitative that refers to Die Himmelssüßogheit (Heaven’s Sweetness), which provided the evening’s theme. Here, as in later works, there was a lot solo flute work for the only Czech member of the orchestra, Michaela Ambrosi. There was a small chorus whose main interventions were brief chorales at the beginning and end of the cantatas. Not in the second one, Süßer Trost, mein Jesu kömmt, which did not start with a chorale. The third cantata, Sei Lob und Ehr dem höchsten gut, was distinct from the other two, in that each section always ended with the invocation Gebt unserm Gott die Ehre (Give Honour to our God). In all three cantatas, one heard some very fine voices in arias and recitatives. French counter-tenor Julien Freymuth was heard in all three, as was German bass Florian Küppers. There were also German sopranos Maike Raschke and Sonia Grevensbock, Polish tenor Alexander Rewinski, German tenor Fabian Kelly and Austrian bass Philipp Kranjc. The orchestra also included members from Croatia, six other Spaniards and others from Italy, Croatia, the Netherlands and Poland. This was a truly supranational family of great excellence.